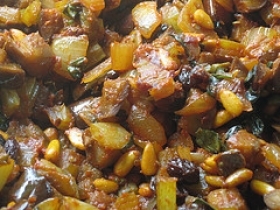 Have you made Caponata Di Melanzane? This recipe is a good source of Vitamin A with 14% of your daily recommended intake per serving. This recipe is high in Vitamin C with 83% of your daily recommended intake per serving. This recipe is a good source of Vitamin E with 14% of your daily recommended intake per serving.